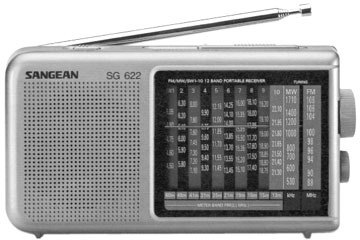 The Sangean SG-622 is an attractive and affordable AM, FM, shortwave radio. AM coverage is 530 to 1710 kHz. The ten shortwave bands cover: 4.5-5.05, 5.8-6.3, 7.1-8, 9.3-9.9, 11.45-12.15, 13.40-14.05, 15.1-15.85, 17.4-18.1, 18.75-19.2 and 21.3-22.1 MHz. Click here to view dial. This model includes a tuning LED, 2.5 inch speaker and 4.5 VDC [  ] input jack. There is also a mono mini (3.5 mm 32 ohm) earphone jack on the side of the radio (earphones not supplied). Click here to view controls. Requires three AA cells not supplied or optional Grundig G2ACA wall adapter. 6.5 x 3.5 x 1.3 inches (164x90x33mm 240g). One year limited warranty. Copyright 2001-2015 Universal Radio, Inc.